Background: The recent emergence of multidrug-resistant strains of M. tuberculosis that are resistant to two major effective drugs, viz. isoniazid and rifampicin, stimulated us to make an attempt for the development of a new class of potent antitubercular agents by modifying the structures of existing drugs. Aiming this, an efficient synthesis of glucose linked-isonicotinoyl-1,3,4-thiadiazolidines has been carried out. Method: The title compounds have been synthesized through cyclocondensation reaction of 1- isonicotinoyl-4-aryl thiosemicarbazides with N-tetra-O-acetyl-β-D-glucopyranosyl isocyanodichloride. The structures of newly synthesized compounds were verified by IR, 1H NMR, 13C NMR, mass spectrometry and elemental analyses. The title compounds were evaluated for their in vitro antitubercular potency against M. tuberculosis H37Rv strain using Lowenstein-Jensen method. Results: A few title compounds were found to be equipotent with the reference drug rifampicin, while moderately potent, when compared with the reference drug isoniazid. These compounds were subjected to molecular docking studies and their results were found to be in agreement with the in vitro studies. 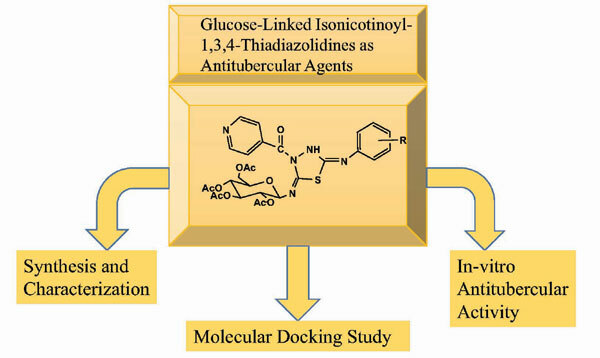 Conclusion: We reported simple and efficient protocol for the synthesis of series of bioactive glucoselinked isonicotinoyl-1,3,4-thiadiazolidines by utilizing N-tetra-O-acetyl-β-D-glucopyranosyl isocyanodichloride as a suitable reagent for glycosylation. This approach is a valuable addition to the fastdeveloping field of glucose-linked heterocycles and might be used to develop new potential drugs. We demonstrated the introduction of isonicotinoyl and glucosyl moieties in single molecular framework which may prove beneficial for developing new class of antitubercular agents. 1, 3, 4-Thiadiazolidines, antitubercular agents, glucopyranosyl isocyanodichloride, isonicotinoyl thiosemicarbazide, M. tuberculosis H37Rv strain, isoniazid, molecular docking.